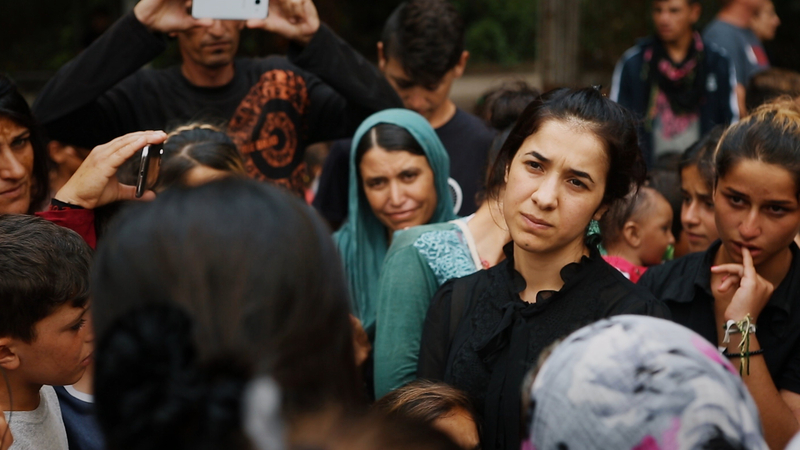 The subject of Alexandria Bombach’s On Her Shoulders is an extraordinary woman, Nobel Peace Prize winner Nadia Murad, and her tireless campaign for justice for the Yazidi people. Bombach demonstrates how Murad’s selfless devotion to the cause win hearts and minds and leads her to become the United Nation’s first Goodwill Ambassador for the Dignity of Survivors of Human Trafficking. In August 2014, Murad was just twenty-one when her Yazidi village in northern Iraq was taken over by violent ISIS soldiers. She was raped and enslaved before making her escape. After being smuggled out of Iraq in early 2015, she was granted refugee status in Germany. Bombach follows Murad’s efforts to raise awareness of the human trafficking of the Yazidis and bring ISIS before the International Criminal Court on charges of genocide and crimes against humanity. Early on, Murad states to camera that she does not want to be remembered as a victim of ISIS. She prefers to be thought of as a refugee, rather than an activist. Her family were farmers and she never intended to become a spokesperson for her people. Instead, she had dreamed of opening a beauty salon. With heavy irony, we watch her having her hair cut and styled in a smart salon before a media interview. We watch Murad’s transformation as she gives testimony before the UN, conducts endless media interviews, visits refugee camps and attends meetings with top government officials in Canada, Germany, Greece, the US, and beyond. Repeatedly she is asked to relive her torture in order to bear witness. Bombach’s camera captures Murad’s extreme courage, her dignity, humility and sorrow – she is wise beyond her years and the weight of her loss hangs heavily on her. Bombach also conveys the paucity of the international community’s response to the genocide. Many of the powerful men and women Murad meets offer to take her on a tour, are shown weeping, utilising photo ops, or proudly give her gifts, whereas all Murad desires is their assurance that those responsible will be brought to justice. It is particularly telling that her campaign gets a massive boost when celebrity attorney, Amal Clooney, comes on board. Another hero in the film is Murad Ismael, who co-founded the NGO Yazda. Ismael is Murad’s translator and friend. He travels the world with her, frequently holding her hand, supporting, hugging and protecting her. At one point he refuses to translate a statement from Luis Moreno Ocampo, the first prosecutor of the International Criminal Court, claiming it will upset Murad too much. Ocampo is another formidable ally; at one point he observes publicly that by splitting up Yazidi refugees, Europe is merely “finishing the genocide started by ISIS.” Interspersed throughout this footage are shots of Murad, against a black background, looking to camera and speaking directly to us. It is well-known that reliving trauma is immensely damaging for survivors. Wisely, Bombach does not elaborate on, or reveal, Murad’s testimony of the torture she endured. It is enough to know that she escaped with her life. Instead, Bombach illuminates the ongoing anguish of the exiled Yazidis and the toll taken on their primary spokesperson. Shortlisted for the 2019 Best Documentary Feature Oscar, this powerful film deserves a wide audience. For those who find it difficult to sympathise with the plight of refugees, On Her Shoulders is a must see.